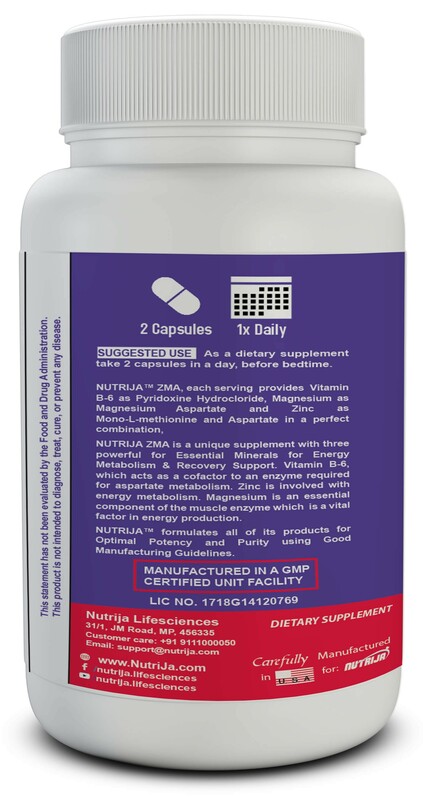 NUTRIJA ZMA is a unique supplement with three powerful Essential Minerals for Energy Metabolism & Recovery Support. Vitamin B-6, which acts as a cofactor to an enzyme required for aspartate metabolism. Zinc is involved with energy metabolism. Magnesium is an essential component of the muscle enzyme which is a vital factor in energy production. Vitamin B-6 ( as Pyrodoxine HCl) is responsible for producing a necessary coenzyme in the body. Vitamin B6, also known as pyridoxine, is a water-soluble vitamin that your body needs for several functions. It’s significant to protein, fat and carbohydrate metabolism and the creation of red blood cells.It also Improves Mood , quality of sleep and Reduce Symptoms of Depression. Boron (as Boron Citrate), Boron appears to be very adept at limiting the amount of (SHBG) in your blood. SHBG binds to testosterone and carries it throughout your bloodstream supplementing 5mg of Boron every day increased free testosterone levels that can free up your testosterone levels which leads to muscle growth and strength. As a dietary supplement , Take 2 Capsules in a day before your bedtime.